From learning English symbols to teaming up to trick their prey, dolphin intelligence continues to surprise researchers. National Geographic photographer Brian Skerry catches the dolphins' remarkable behavior in action. Brian Skerry: Researchers have told us an awful lot about these animals but there is a lot more waiting to be revealed. There lies endless potential for discovery and maybe for enlightenment. These are, arguably, the most intelligent animals in the ocean. And with this story I've worked with five different species of dolphins in nine locations around the world and I wanted to make photos that would allow us to see into the dolphins' world. You know, just parts of the dolphin world. There is so much that we don't know. After spending probably two years on this subject, I've come to the conclusion that there is far more that we don't know about these dolphin minds than we do. But we have seen ways that they can be smart. So that's what I wanted to show you tonight is a look at some of the ways dolphins are smart. And I have a small video, a short video here, that frames this subject sort of nicely. 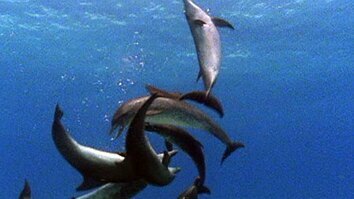 It's narrated by Dr. Diana Reese, who is a dolphin researcher and especially articulate on this subject. Dr. Diana Reiss: The challenge is to understand this kind of intelligence. I talk about dolphins as a non-terrestrial intelligence. These are totally aquatic mammals with big brains. And I think we often get stuck with looking for intelligence through our human lens. We see it the way we expect it to be rather than thinking about what are the sensory systems of these animals, what are the environmental and social pressures that they face in their daily lives and thinking about their intelligence like that. Interestingly, they show so many things that are similar to what we do, like mirror self-recognition. Like being able to learn vocally. Their vocal behavior. We learn different things by studying animals out here in the wild and in aquaria. And it's the marriage of those two approaches that gives us the richest picture of what's going on in the minds of these animals, in the lives of these animals. These are societies in the sea. What are these big beautiful minds doing? These are highly complex, they are packed with neurons. They've got brains second to ours in size. What are they doing out here with them? And how do they use them? The researcher and the species that has been studied the longest is the spotted dolphin that we see here. And they've been studied by a researcher named Dr. Denise Herzing who for, about 30 years now has been collecting data on the spotted dolphins of the Bahamas. This is Denise right here. She has, sort of, been called the Jane Goodall of the sea for her three decades of work getting to know over three generations of dolphins. And during that time, she's correlated, among the research she's done, she's correlated dolphin sounds with behaviors to try to unlock the mysteries of their communication. Very exciting stuff. In this photo, that's Denise on the right of the frame there, she is wearing something that she developed called the CHAT. C-H-A-T. Which stands for Cetacean Hearing and Telemetry. It's essentially a computer that she can wear underwater that's capable of both transmitting and receiving dolphin vocalizations. When that CHAT box recognizes one of the pre-programmed sounds that she has put in there after decades of research, a human voice translates the sound into Denise's headset. So she's got certain words that she knows the dolphin has said, you know, so, sargassum seed or if she brings a rope or a scarf into the water, she tries to do that. And she can also type on a keyboard words out to the dolphin. So signature whistles and different dialects that she has, sort of, identified. So, this is really the only... only the very beginning but what she's hoping for, in time, is to develop true two-way communication with dolphins. You know, kind of a dolphin Rosetta Stone is what she has developed here. There's only three of these in existence. And, as I said, she is just getting started. Dolphin research in the wild is very difficult. And because of this, a number of researchers study captive animals. 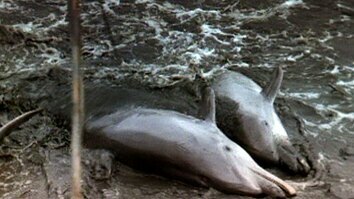 Now there is certainly no shortage of controversy when it comes to the subject of captive dolphins. None of the researches that we worked with, that I worked with on this story, would support, you know, catching wild dolphins these days for aquariums. This was a very old bottle-nose dolphin that I photographed in Vallejo, California at Six Flags. He was playing with his Batman basketball here, a little cognitive stimulation. But it was in that facility that a researcher named Dr. Stan Kuczaj from the University of Mississippi had an experiment. He created a maze out of PVC pipe. It was similar to finger mazes that chimpanzees have been used with over the years. And the way this worked is he made a gelatin ball... That's the yellow gelatin ball. And he would drop in the top of the PVC pipe at the top. And then the dolphin had to figure out how to get it out the bottom. It would use its rostrum to, sort of, poke it and prod it along and then get it out. Well, the dolphin figured this out in about a second and a half. It took no time at all. And then once it came out the bottom the dolphin could eat it. So it was a little bit of a reward. So, Stan then created another experiment with dolphins that he works with in Key Largo, Florida. He took another piece of PVC, a PVC tube and he glued an end cap to it. And on the other end cap it wasn't glued. It would just, sort of, fit snugly on the other end. And he put fish inside. He showed the dolphins that there were fish inside. And he had ropes on either end. And the theory here was that the dolphins would have to communicate. They'd have to not only problem solve, but they'd have to communicate and work cooperatively in tandem to figure this out. So, he showed it to them and threw it in the water. And as you can see the dolphins, again, really... It maybe took a minute and half this time. But once again nailed it. One would hold it while the other one pulled the rope. And then they had the fish, they popped out and they could sort of enjoy the spoils of their victory here. So, very, very smart. He, as a cognitive biologist, has worked with many different animals. He was quite surprised at just how quickly they would figure this stuff out. Um... Another place that Stan is working with captive dolphins is in Honduras. On the island of Roatán. Because it's so large and because there's 30 dolphins, and there are so many dolphins, that scientists can observe, sort of, natural alliances that are formed. Social behaviors. But, you know, groups would form little cliques, males fighting with each other, mating groups and so forth. Quite interesting. You know, the way they raise revenue at this place, or places like this, is through these dolphin experiences, where tourists can come down mostly off cruise ships, and have these, sort of, little interactions with dolphins. It's not my cup of tea, not the kind of thing that I would really advocate. Anyway, well the captive stuff was interesting but, as always, I just wanted to get out into the wild. Because this is, you know, where it happens for me... One of those species I photographed was the spinner dolphins in Hawaii. These are animals that are known for their aerobatic, you know, leaps and spins. Probably to shake parasites. I think they do it just because they can but... These are some of the most social of all dolphin species. You almost never see a single animal out there, or even a group of three or four. They're always in these very big groups. It's also the only, well, one of the few dolphins, that has never successfully been kept in captivity because they need that social stimulation. They need to be with big pods as we see here. One of the behaviors that I was really hoping to photograph but didn't know if I was gonna be successful, was game play with dolphins. Particularly with the spinner dolphins. I had heard that sometimes you can see them playing games with leaves that fall into the water. They'll pick up a leaf, as we saw in the video, on their pectoral fin or their tail or their dorsal fin and then they swim through the water and then they pass it to one another in this, you know, morning game of catch. So this one particular morning, most of the times I was working off of boats, but this one morning I went in from a little cove off the island of Kona, the big island, and I swam out. It was early in the morning and I was just blown away. I saw these three spinner dolphins that were just adorned with leaves. They were playing with these leaves. One on its dorsal, tail and pectoral. And light levels were very low, so I, sort of, boosted the ISO and was able to make this picture of them playing catch. Well, one of the other things that I wanted to focus on with this story about how dolphins are smart was to look at feeding strategies. Because unlike many other animals, dolphins have developed unique feeding strategies depending where in the world they're located geographically. They have invented these ways of feeding that are quite interesting. In the Bahamas, bottle-nose dolphins have developed a strategy known as crater-feeding. They use their echo location, their sonar, to find little fish that are hiding under the sand and when they find a fish, they position their body vertically and, sort of, dig with their rostrum down into the sand, creating this crater. It's like seeing a dolphin growing out of the bottom of the ocean here when you swim down like this. So, again, this is all free diving down about 30 feet trying to be stealthy to get close enough to get a picture like this. In Florida, bottle-nose dolphins have developed a completely different feeding strategy. This is in Florida Bay, near the Everglades, where these dolphins have developed something called mud-ring feeding. 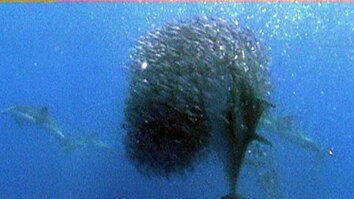 And the way this works is a single dolphin will make a perfect mud ring around a school of fish and he does that by, it's in very shallow water and he'll swim around using his tail to disturb the mud, making little plumes of mud, eventually encircling the fish. And the fish will freak out but they won't swim through the mud ring they actually leap over. So his buddies who are waiting out there, with their... with their mouths open and then he comes around too. And you know, the fish literally jump right into their mouths. This stuff had never been photographed before. I was able to do this from a helicopter with a 500 millimeter lens and I used this steadying device called the glide-cam that actually allowed me to shoot with that one lens from a moving helicopter. Pretty interesting stuff. In Patagonia, Argentina, I wanted to work with dusky dolphins because I knew that dusky dolphins have a strategy where they use communication in a cooperative feeding event, where they will use the sound to create bait-balls of anchovies. There is lot of anchovies in the Gulf of Nuevo here. And they also do this leaping behavior, not unlike the spinners, but they'll leap out of the water. Scientists tell us that that's for two reasons. One, is to create a splash that scares the fish into these tight balls. But it also evidently calls dolphins from across the bay to come and help in this feast. So the water here is temperate water. It's quite cold. And when I was there, it was really thick with plankton and algae. The visibility wasn't that good. Very tricky to photograph these highly contrasted dolphins but that was the behavior I wanted to photograph, This cooperative feeding. So, I spent three weeks in Patagonia and I didn't see anything until the very last day. It was literally the last ten minutes of the last day. I way out in the Gulf in a small boat and was pretty much ready to give up and surrender, and we saw birds working. And the captain of the boat said I think something must be happening, Brian. So, with a little 30 foot cubic bottle on my back, I dove down. And I came upon this scene where we had six dusky dolphins feeding cooperatively. I got there sort of at the tail end. But you still see a little ball of anchovies here. And the dolphin at the bottom was just about to pick off one of the anchovies. All the white particles there... Those are fish scales. And, there is a penguin, a magellanic penguin that had an anchovy in his mouth that was down there. And even a sheer water bird that was diving down. Everything joins in on this feast. So sometimes things do go right. A bit of serendipity here. But all... all good. Well, the last species of dolphins that I wanted to share with you tonight, and the last feeding strategy actually, occurs with the biggest and most intelligent species of dolphin and that is the orca. So to photograph this unique strategy, I returned to Patagonia a year later, at a different part of Patagonia, this was Punta Norte in the Valdes Peninsula. And it was a strategy known as a stranding behavior for orcas. This is the object of their desire: The little sea lion pups that are born in January and about by April, they begin testing the waters and going in and sea lion pup is what's for dinner. This is the only place in the world where these orcas have developed this strategy where they will actually come up on the beach. And almost strand themselves to try and catch one of these sea lion pups. It was amazing to see this. They have to be very resourceful to do it because it can only happen when the tide is high. They don't want to get stranded at low tide. It can only happen in places where there's, sort of, a natural channel where they can do that. The pups have to be there, and sort of in the surf zone. They can't expend a lot of energy, you know, wasted energy to do this. But here you see one of those orcas very close to shore in this jade colored sea here, just sort of cruising along. And when the moment is right, that orca will just turn on a dime and just come racing in. And the pups, you know, are just clueless. They have no idea what's happening. It's like, “Oh, are you my friend?” You know, and this thing is just waiting under the waves here. And this is the next frame in the sequence a millisecond later. By that time the pups usually figure it out but it's-- it's usually too late and they will just kind of race right in and grab them. And sometimes the females, this is largely done by females, and they'll take the pup out while it's still alive and they actually play with it off shore. It's, kind of, this gruesome game where they'll flip it up with their tail. That little pup is actually screaming, you can see the mouth is open. And it's teaching, the orca is teaching it's calf, it's a calf on the left of the frame there. So, this is all learned behavior. You know, this is what dolphins do. It's not inherent in their DNA. It's moms teaching calves and sort of this culture, if we can use that word, where they're passing this on to the next generation. But you know, sometimes they are not successful and I guess nature gives and takes. And we see, one of the pups here getting away and the orca has to wiggle its way back into the ocean and try for another day. A happy ending for the seal-- seal pup fans in the audience here. So... In closing, we slip back beneath the surface looking into the eyes of dolphins and can't help but wonder how much more do they know. What are they really thinking? Researchers have told us an awful lot about these animals and about the entire ocean for that matter. But there's a lot more waiting to be revealed. Within the sea, there lies endless potential for discovery and, maybe, for enlightenment. Thanks very much.